Exemple tourtrip for 2 days. Hotel or guesthouse overnight is NOT included.On the way we can choose where you want to stay. I pick you up from your hotel or guesthouse and depart at 09.00 AM for our trip to Lovina Beach North Bali, we will visit some interesting sites on the way. First we go to the famous temple Tanah Lot. 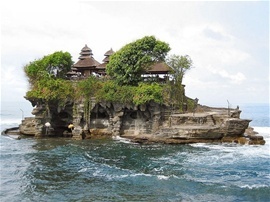 Tanah Lot means "Land in the Sea" in the Balinese language. Located in Tabanan about 20 kilometres (12 mi) from Denpasar, The temple sits on a large offshore rock which has been shaped continuously over the years by the ocean tide. Tanah Lot is claimed to be the work of the 16th-century janitor baratha. During his travels along the south coast he saw the rock-island's beautiful setting and rested there. Some fishermen saw him, and bought him gifts. Nirartha then spent the night on the little island. Later he spoke to the fishermen and told them to build a shrine on the rock for he felt it to be a holy place to worship the Balinese sea gods. After this we go to Belimbing. 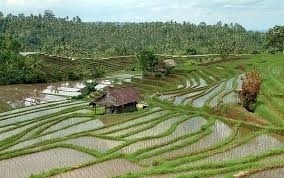 As you can see from the video, walking in the rice paddies of Belimbing is very pleasant. Yes, you can see the rice terrases really well from the high road and from the top of the hills, but bali rice tracking lets you experience Belimbing better. And the road can get noisy, when all you want is to walk hand in hand in this beautiful landscapre. When we have a great experience we go further to pupuan village.Pupuan is located in the western part of Bali, a place to fill your eyes with awesome memories of great landscape. Before the last stop we go to Banjar Hot Spring.Banjar Hot Water is a nature hot wellspring from the ground and it is believed can heal the disease. Its water is accommodated at one small swimming pool encircled by unique rural nature.Enjoying the hot water fall, you can feel like squeezing, especially at pool equipped by the douche with the high about 3,5 meters, so that can make the body refresh and relaxation. After this we go to Lovina. We look for a hotel. I recommend Sartaya or Aditya Hotel. In Lovina the sea water temperature is 27°C, so you can spend your stay at Lovina beach swimming, lazing in a deckchair or chilling out in one of the beach bars for diner. Early in the morning on day two of this beautifull trip, you’ll hop on a boat for a dolphin-spotting trip. Luckily the fishermen know where the shrimp are hiding in the currents and before you know it, you'll hear splashing alongside the boat as the first group of dolphins appear. This excursion will last about 2.5-3hrs and afterwards you can enjoy breakfast back at the hotel. If you are ready we go to the Munduk waterfall. A little bit tracking.The Munduk waterfall is situated at an altitude of between 800-900 meters above sea level .This water fall is located in the village Munduk. After this we go to Twin Lake. Lake Buyan and Lake Tamblingan, separated by a rainforest-covered hill, are known as the Twin Lakes. This sight is a great overview of the volcanic heart of Bali. Volcanoes have created and shaped this island, creating volcanic cones and lakes, and producing rich soils enabling a lush forest to grow. Lake Buyan (on the left here) is Bali’s second biggest lake, after Lake Batur. we drive further and if you want to stop for foto´s+ this is possible. We drive to Brathan Temple.Pura Ulun Danu Bratan is an important water temple on the shores of Danau Bratan (Lake Bratan). Built by the King of Mengwi in 1633 (who later built another water temple, Pura Taman Ayun) this temple is dedicated to the lake goddess, Dewi Danu, to ensure plentiful water. At last i can drive you to the traditional fruit market if you like. After this i bring you back to your hotel. You have two wunderfull days! thanks for your email. Please give me your address in Bali . Of course, I am very proud can serve you during in bali. 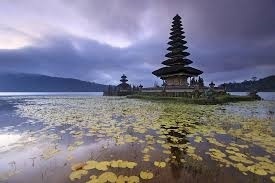 We (2 adults) are in Bali now and would like to know if we can make a 2 days trip to Lovina. We would like to start on thursday.